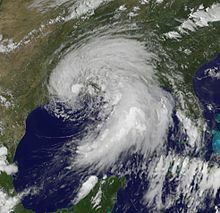 ^ Active 2011 hurricane season breaks 'Hurricane Amnesia'. National Oceanic and Atmospheric Administration. 2011-11-28 [2016-04-22]. ^ 5.00 5.01 5.02 5.03 5.04 5.05 5.06 5.07 5.08 5.09 5.10 5.11 5.12 5.13 5.14 5.15 5.16 Lixion A. Avila; John Cangialosi. Tropical Cyclone Report: Hurricane Irene (PDF). National Hurricane Center. 2011-12-14 [2016-03-03]. （原始内容存档 (PDF)于2016-03-03）. ^ 6.0 6.1 6.2 6.3 6.4 6.5 6.6 Daniel P. Brown. Tropical Cyclone Report: Tropical Storm Lee (PDF). National Hurricane Center. 2011-12-15 [2016-04-22]. （原始内容存档 (PDF)于2016-03-04）. ^ 2011 Tropical Cyclone Advisory Archive. National Hurricane Center (Archive) (Miami, FL: National Oceanic and Atmospheric Administration). 2009-02-07 [2016-04-22]. （原始内容存档于2016-03-04）. ^ 8.0 8.1 8.2 8.3 8.4 John L. Beven. Tropical Cyclone Report: Tropical Storm Arlene (PDF). National Hurricane Center. 2011-12-07 [2016-04-22]. （原始内容存档 (PDF)于2016-03-04）. ^ 9.0 9.1 9.2 9.3 9.4 Stacy R. Stewart. Tropical Cyclone Report: Tropical Storm Bret (PDF). National Hurricane Center. 2011-12-05 [2016-04-22]. （原始内容存档 (PDF)于2016-03-04）. ^ 10.0 10.1 10.2 10.3 Daniel P. Brown. Tropical Cyclone Report: Tropical Storm Cindy (PDF). National Hurricane Center. 2011-09-16 [2016-04-22]. （原始内容存档 (PDF)于2016-03-04）. ^ 11.0 11.1 11.2 11.3 11.4 Michael J. Brennan. Tropical Cyclone Report: Tropical Storm Don (PDF). National Hurricane Center. 2011-10-28 [2016-04-22]. （原始内容存档 (PDF)于2016-03-04）. ^ 12.0 12.1 12.2 12.3 12.4 12.5 Todd B. Kimberlain; John P. Cangialosi. Tropical Cyclone Report: Tropical Storm Emily (PDF). National Hurricane Center. 2012-01-13 [2016-04-22]. （原始内容存档 (PDF)于2016-03-04）. ^ 13.0 13.1 13.2 13.3 John P. Cangialosi. Tropical Cyclone Report: Tropical Storm Franklin (PDF). National Hurricane Center. 2011-10-27 [2016-04-23]. ^ 14.0 14.1 14.2 14.3 Robbie Berg. Tropical Cyclone Report: Tropical Storm Gert (PDF). National Hurricane Center. 2011-10-26 [2016-04-23]. （原始内容存档 (PDF)于2016-03-04）. ^ 15.0 15.1 15.2 15.3 15.4 15.5 15.6 15.7 15.8 Eric S. Blake. Tropical Cyclone Report: Tropical Storm Harvey (PDF). National Hurricane Center. 2011-11-30 [2016-04-23]. （原始内容存档 (PDF)于2015-10-02）. ^ 16.0 16.1 Richard J. Pasch. Tropical Cyclone Report: Tropical Depression Ten (PDF). National Hurricane Center. 2012-01-04 [2016-04-23]. （原始内容存档 (PDF)于2016-03-04）. ^ 17.0 17.1 17.2 17.3 John L. Beven. Tropical Cyclone Report: Tropical Storm Jose (PDF). National Hurricane Center. 2012-01-04 [2016-04-23]. ^ 18.0 18.1 18.2 18.3 18.4 18.5 18.6 18.7 18.8 18.9 Stacy R. Stewart. Tropical Cyclone Report: Hurricane Katia (PDF). National Hurricane Center. 2012-01-16 [2016-04-23]. （原始内容存档 (PDF)于2016-03-04）. ^ 19.0 19.1 19.2 19.3 Eric S. Blake; Todd B. Kimberlain. Tropical Cyclone Report: Unnamed Tropical Storm (PDF). National Hurricane Center. 2011-12-02 [2016-04-23]. （原始内容存档 (PDF)于2016-03-04）. ^ 20.0 20.1 20.2 20.3 20.4 20.5 20.6 20.7 20.8 Michael J. Brennan. Tropical Cyclone Report: Hurricane Maria (PDF). National Hurricane Center. 2012-01-11 [2016-04-23]. （原始内容存档 (PDF)于2016-03-04）. ^ 21.0 21.1 21.2 21.3 21.4 21.5 Todd B. Kimberlain. Tropical Cyclone Report: Hurricane Nate (PDF). National Hurricane Center. 2011-11-11 [2016-04-23]. （原始内容存档 (PDF)于2016-03-04）. ^ 22.00 22.01 22.02 22.03 22.04 22.05 22.06 22.07 22.08 22.09 22.10 22.11 22.12 22.13 John P. Cangialosi. Tropical Cyclone Report: Hurricane Ophelia (PDF). National Hurricane Center. 2011-12-08 [2016-04-23]. （原始内容存档 (PDF)于2016-03-04）. ^ 23.0 23.1 23.2 23.3 23.4 23.5 23.6 23.7 23.8 23.9 Robbie Berg. Tropical Cyclone Report: Hurricane Philippe (PDF). National Hurricane Center. 2012-01-03 [2016-04-23]. （原始内容存档 (PDF)于2016-03-04）. ^ 24.00 24.01 24.02 24.03 24.04 24.05 24.06 24.07 24.08 24.09 24.10 Eric S. Blake. Tropical Cyclone Report: Hurricane Rina (PDF). National Hurricane Center. 2012-01-26 [2016-04-24]. （原始内容存档 (PDF)于2016-03-04）. ^ 25.0 25.1 25.2 Lixion A. Avila. Tropical Cyclone Report: Tropical Storm Sean (PDF). National Hurricane Center. 2012-01-12 [2016-04-22]. （原始内容存档 (PDF)于2016-03-04）.